Thanks to a WestJet promo code, there are a few non-stop flights from Toronto to Los Angeles and Palm Springs, California in November and December for $292 CAD roundtrip including taxes. The WestJet promo code expires tonight at 11:59 PM EST. The code is for '25% off' anywhere WestJet flys. However, it's only applicable to flights between November 6 and December 15th, 2017. Many flights in this date range will be expensive by this point. But if you can find a WestJet flight where the price is still reasonable, this code can help bring it down to an excellent price level. 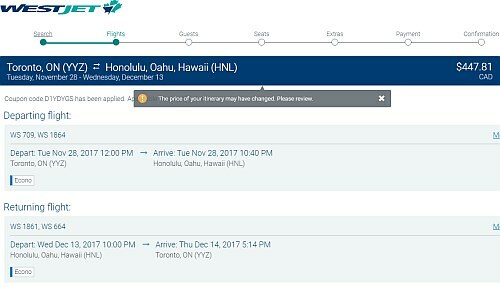 WestJet is also showing a few flights from Toronto to Honolulu, Hawaii for $447 to $471 CAD roundtrip including taxes when using this code! Try this Google Flights search to look for other cheap date combinations. screenshots from the WestJet website. WestJet also has another promo code out that works for a larger range of dates (mid November to mid February) but it's only 15% off. It would have to already be a really great price for this weaker promo code to be enticing enough to use. This offer is valid on WestJet flights within Canada, the U.S., Mexico and the Caribbean. Air Canada also has a promo code out for 13% off flights to Canadian cities, the U.S., and 'Sun Destinations'. It too is valid for dates from mid-November to mid-February. It would have to already be a really great price for this rather weak promo code to be enticing enough to use. The promo code will already be entered. toronto, yyz, westjet, flight deals, united states, california, north america, los angeles, lax, palm springs and psp. 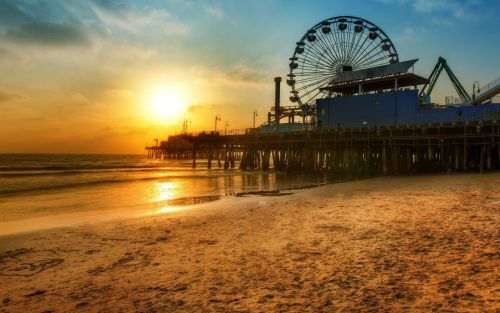 One Response to "Toronto to Los Angeles or Palm Springs, California - $291 CAD roundtrip including taxes | non-stop flights (and Hawaii for $447 CAD roundtrip!)"